Joint replacement surgery, also known as arthroplasty, is when an arthritic or damaged joint is removed and replaced with an artificial joint. 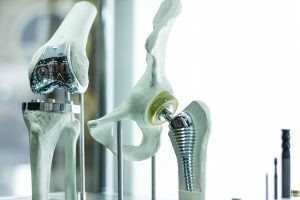 Joint replacement is becoming more common, and each year orthopaedic surgeons perform thousands of joint replacement surgeries. Joint replacement has been identified to be one of the most rewarding surgeries performed. If other surgical and medical modalities fail, a replaced joint can return a patient to near normal function. Research has shown that even if you are older, joint replacement can help you move around and feel better. Hip and knee replacements are the most common, due to the fact that they are large weight bearing joints. The Joint Center at Orthopaedic Associates of St. Augustine is the most highly advanced in the area. Ranging from a partial knee and hip replacements to computer-navigated total replacements; we cater the treatment to the individual patient and specific replacement required. Minimally invasive surgery and select “high-end” options are often used to decrease surgical time and facilitate a rapid recovery. James Grimes, MD, one of the most renowned joint replacement surgeons in North Florida, specializes in full and partial replacements of the hips and knees. Dr. Grimes has been on the forefront of joint surgery for years developing computer navigation for use during partial knee surgery, completing the first arthroscopic resurfacing procedure in the county, and performing the first outpatient joint replacement in the county. He continues to push the boundaries of technology and surgical capabilities at Orthopaedic Associates of St. Augustine and Flagler Hospital where he performs on average more than 800 joint surgeries per year including arthroscopy to partial resurfacing to total joint replacement.